Discussion in 'Sneaker Art' started by Four by Six, Apr 20, 2018. Nice work. I'm ready when you need a wear tester. Four by Six likes this. I'm afraid I'm still working out the kinks. While these two pairs of plates came out beautiful looking, it turns out the curves sagged a little bit while the resin cured. I didn't think the little bit of difference would matter (they are springy after all), but I guess feet are really sensitive and it does matter. While wearing either pair feels great, the plate mismatching the strobel board curves is irritating and hurts after a while. The mismatch also makes the heel pop like the forefoot used to pop on first gen Epics. Looks like I'm going to have to come up with a different process that avoids the sagging during cure time. Arrgggh! Just when I thought I was done. Looks like I'm going to have to come up with a different process that avoids the sagging during cure time. I hope this works, as I'm all out of CF supplies now. LOL! Happy to see Nike copy my uncaged Epics! I'm somewhat concerned the leather heel strap might rub the achilles tendon, but probably not. And the tall upper flyknit might rub the ankles, so at least mid socks would be needed. Can't wait to get my hands on these (though in a different color way). My uncaged Epics are my favorite shoe by a long mile. Slip on quickly, super comfortable, light as a feather, cool and breathable, and believe it or not it has become my goto shoe for long runs. In theory it should be too loose and slip around and cause hot spots and blisters, yet in practice it stays in position. Actually, I noticed that I no longer had any foot fatigue after runs which I am guessing is because of the increased blood flow to/from and around my foot. Not sure why. I've also learned these make an excellent bad weather shoe. The only thing thing that holds water is the open cell foam insole. 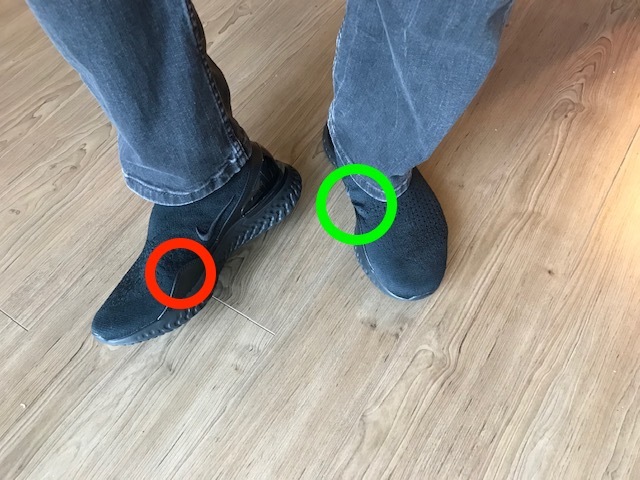 A trick I learned is if you use a waterproof or GoreTex bootie, put the insole inside the bootie with your foot and sock and then put on the shoe. Your foot stays dry and warm, and then when you take the shoes off, they self dry very fast. No need for a Pegasus Shield. You can see in this pic they added reinforcement to the inside ball area of foot. 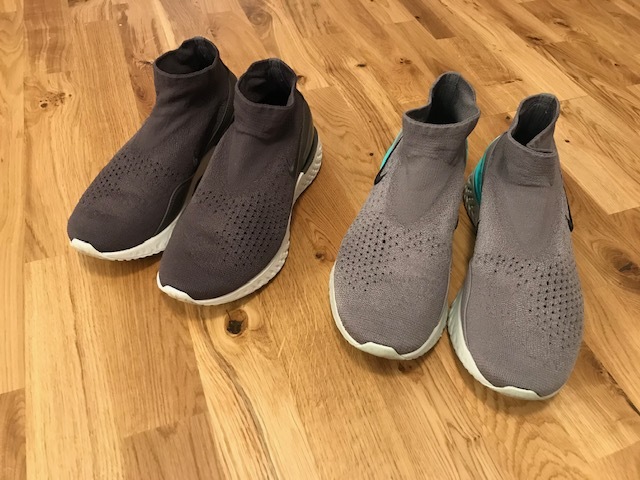 I have noticed with my uncaged pair, the foot does want to squish out a bit and tries to overhang the midsole a little bit in that spot, but nothing too bad. 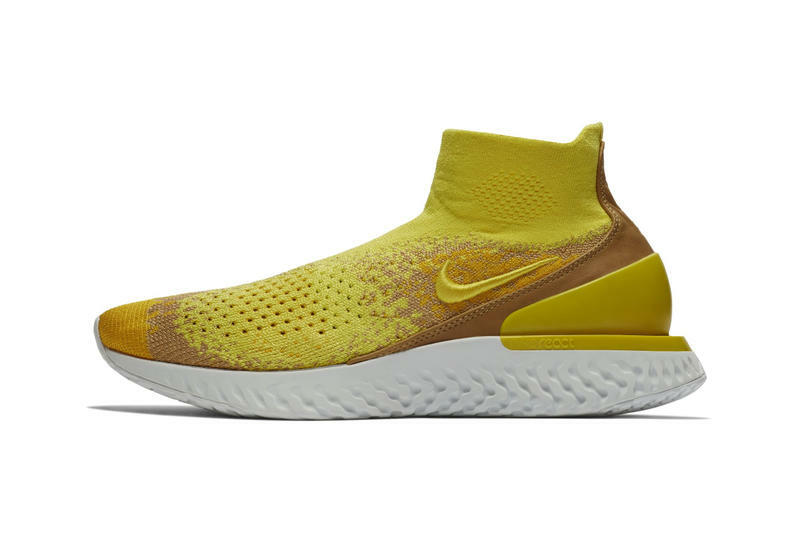 You can also see they went with a smaller embroidered swoosh, which I assume will let the flyknit flex more than the huge heat glued on swooshes of the Epic. 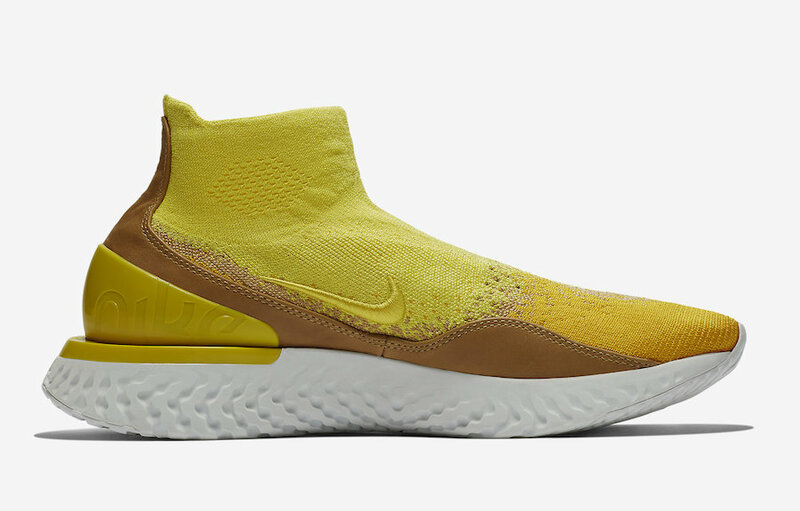 As far as I can tell the upper has no reinforcement panels at all, other than the aforementioned leather inserts, so the flyknit should be free to flex as needed. I hope all the leather is not irritating or too confining. Now all I need is a Triple Black Colorway please! Wow, they really copied your idea. I would like to know how many ideas, designs, and colorways have been copied by Nike from Niketalk over the years. Maybe they do not car because there would not be Niketalk without Nike? Wow, they really copied your idea. I would like to know how many ideas, designs, and colorways have been copied by Nike from Niketalk over the years. Maybe they do not care because there would not be Niketalk without Nike? I'm sure they get lots of "inspiration" from ideas on Niketalk. They overthought the Rise though, as I don't think it needed leather reinforcements or a full bootie upper. All they had to do is take the Epic and stop the manufacturing process before they cut the lace holes and glued on panels. It would be ridiculously cheap to make, just a one piece flyknit upper and REACT foam sole. Offer it at Pegasus prices in a lot of colorways and it would make crazy money for them. 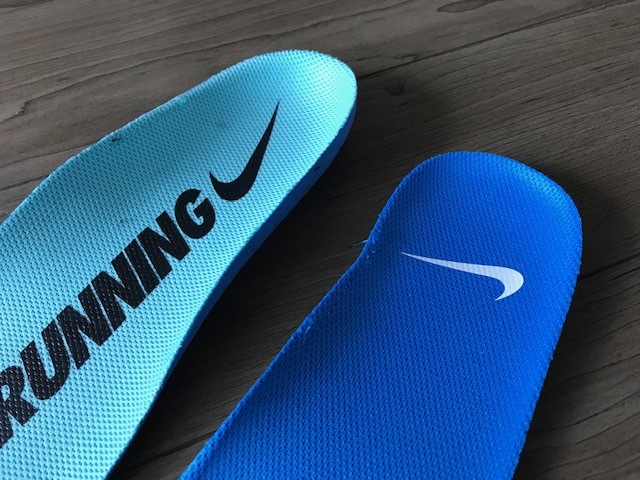 The comfort and convenience of a slipper with the performance of a running shoe. 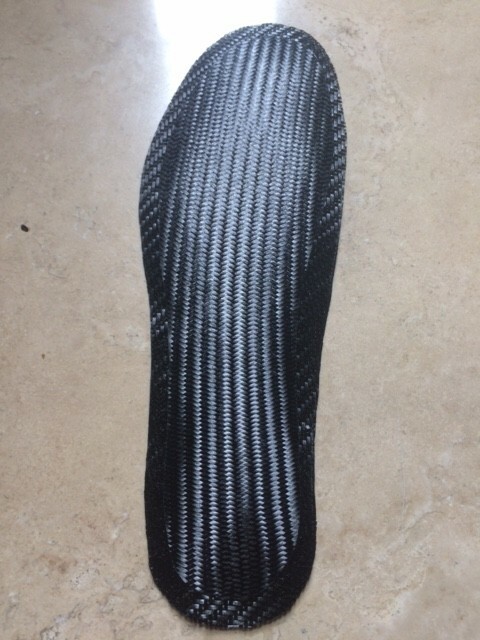 And when you add a carbon fiber insole, performance is in the same league as the 4%. Add a GoreTex bootie and it outperforms the Peg Shield. It would only work for lifestyle and running use though, as it does not have enough lockdown for anything that requires cutting side to side like basketball or soccer. Can't tell from pic what reinforcement panels are still on the inside, but I bet they keep them all and just lose the outer panels (just a guess). Otherwise the laces would rip through the flyknit. 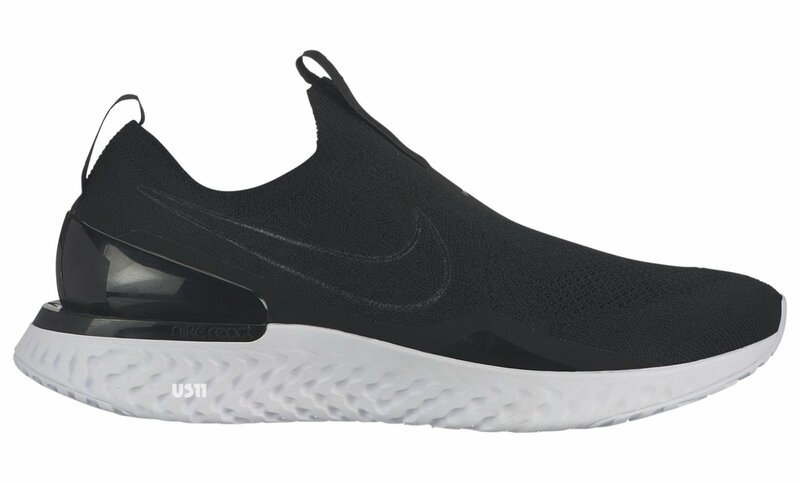 If this rendition turns out to be true, "uncaging" the Epic2 by removing the laces and reinforcement panels could be awesome. The current cut lace holes tend to fray once the panels are removed. The lace holes on the Epic2 appear to be not cut out, but woven into the upper. Not liking the heavy embroidery on the large Nike swoosh as it will prevent the flyknit from stretching. Also not liking the smaller outer heel cup. My experiments proved the inner cup was insufficient for heel stability. Hard to tell but probably still has the inner reinforcements, especially the band between the forefoot and heel. Not liking the direction of this shoe, if this turns out to be the Epic2. I liked TF XC's guess at the Epic2 much better. I wouldn't even cop this version. From Dragicon in the REACT thread: The Epic Phantom. Much closer to my concept. Nike added a pull tab to the front tongue area, which is not really needed, as the upper is very tall there and easy to grab. The inner ball area reinforcement is on the outside of flyknit upper so it shouldn't rub or irritate the foot inside. Can't tell from the pics if there are any inner reinforcements that might keep the flyknit from stretching. I love the subtle embroidered swoosh, as it will not prevent the flyknit from maximum stretching. 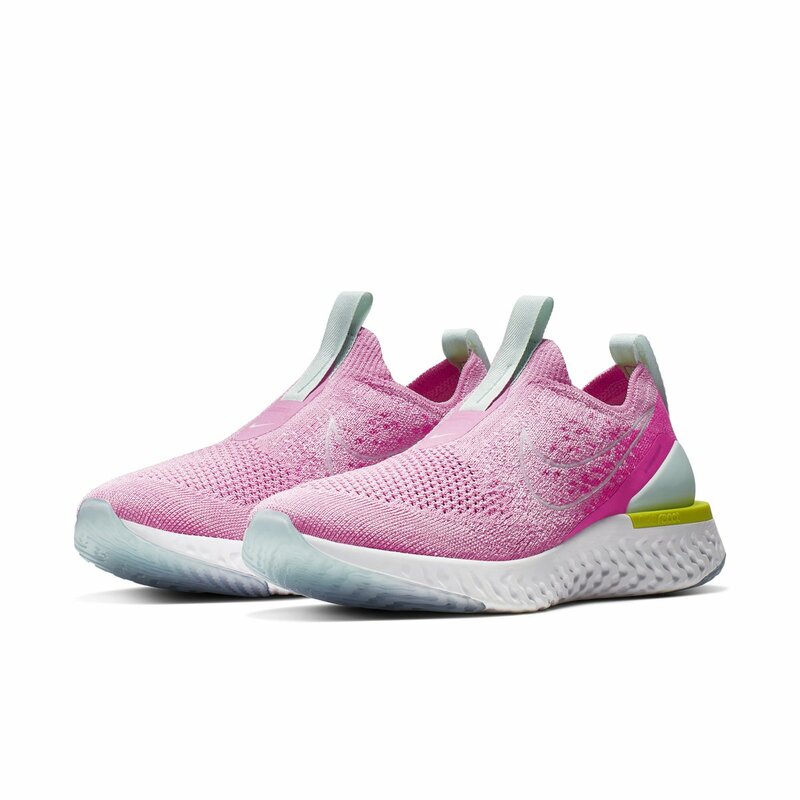 It appears the flyknit is woven differently than the Epic Reacts as the color fade is different in some of the colorways. I hope they make lots of awesome colorways. Triple black for work, and an oreo like the upcoming ER2 please Nike! I'm gonna go broke buying the Phantoms - I'm tired of modding all the ERs, I've done over a dozen pair already. What kind of solvent did you use? Did it decolorate the black knit? I tried several solvents... what worked best for the heat activated glue on the ER was simply 100% acetone, and it did not appear to decolor the black flyknit. On other Nike shoes, they use other glues requiring different solvents. Boiling water still works best for upper swaps. I just picked up the new triple black Rise to use as a work shoe. I posted a couple pics in the REACT thread. They feel very different than my triple black ER1s. The forefoot flyknit is not as tight and is much more comfortable. The additional leather reinforcements really lock down the heel and almost feel like a hiking boot at times. There is no way you can use this as a running shoe. Yes, I tried running in them for about a mile, and it works, but no these are not runners despite Nike categorizing them in their running lineup. At first wear, the tip of the leather reinforcement circled in red dug into the side of my foot and worried me. However, once broken in, I don't feel this anymore. Also, you can see the upper wants to bunch up a little in the green circle. Again, I don't notice or feel this bunching up. The shoe is a little bit hotter than the ERs, despite the additional cooling holes in top of forefoot flyknit upper. I love these and think they are the perfect work shoes. They look more formal and provide a bit more protection. And if you travel frequently, they slip on and off quickly at airport security - no laces to re-tie. The latest teaser pic of the Epic Phantom has a revised heel counter that is different than the first pics. The first EPs had a full heel counter like ER1s. The new Teal CW teaser has a heel counter like ER2s. Maybe the delay in releasing the Epic Phantoms was development occurred during the transition from ER1 to ER2 and they had to update it to match. 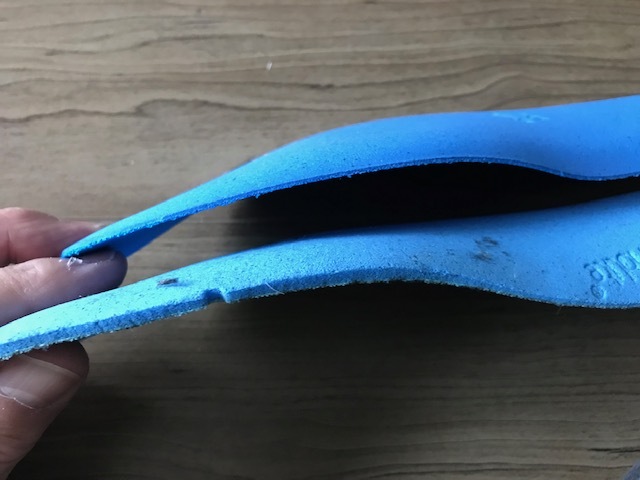 It also appears they got rid of some of the forefoot plastic reinforcement intended to prevent foot spillover the midsole, though the pic only shows one side of the shoe. 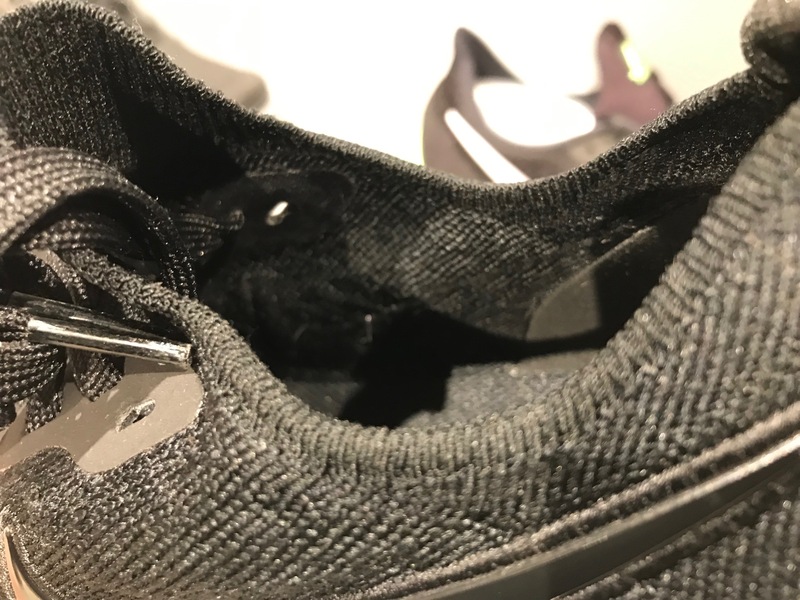 Today I checked out the ER2s at a store. It appears Nike got rid of the rubber heel strap that I always remove in my ER1s anyway. The heel strap is a strip of rubber connecting the rear heel counter to the inside lace reinforcement panels. Its purpose is to transfer forces on the heel to the entire shoe structure. Unless you are a powerful elite runner or sprinter, it is probably overkill for most people. There were two problems with it. 1) It prevented the opening of the shoe from stretching when putting the shoe on, making it more difficult. 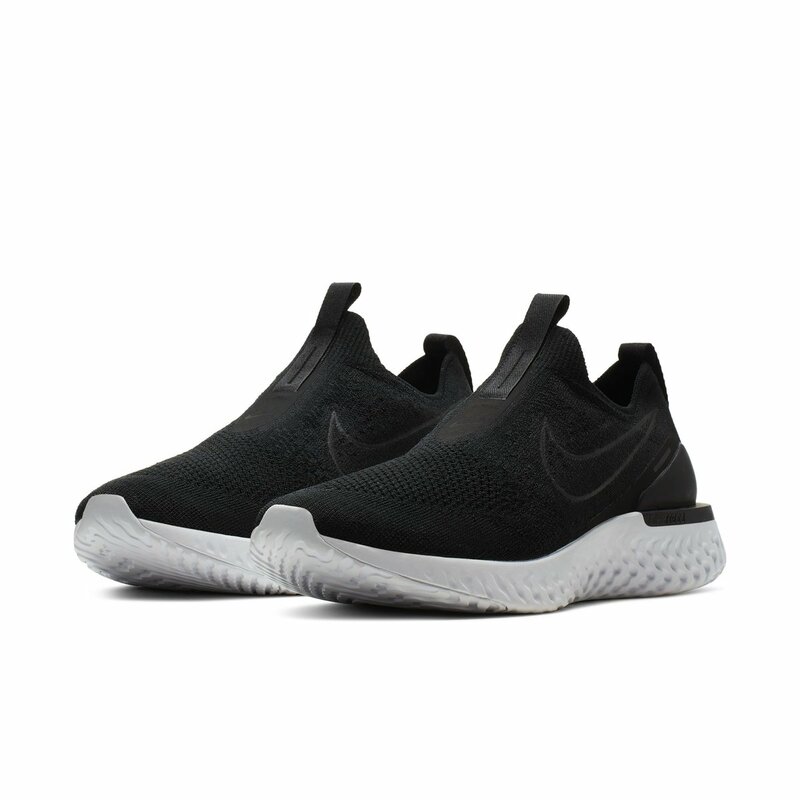 2) It prevented the flyknit on the sides of the shoes from flexing, thus reducing the comfort. More good news: It also appears the new embroidered swoosh floats on top of the embroidery enough that the flyknit flexes really well. The swoosh on ER1 appeared to prevent the flyknit from stretching. The ER2 flyknit seems to have plenty of stretch where the swoosh is. 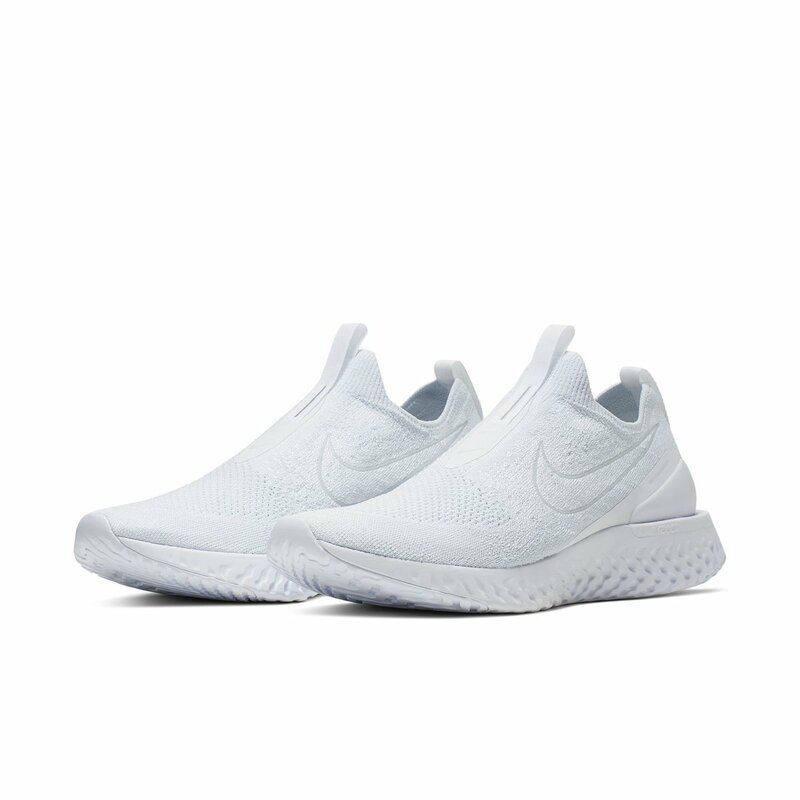 I just noticed the random prize drawing for the April NRC Challenge is a pair of "Nike Phantom REACT sneakers", so unless they mean a pair of one of their soccer shoes, maybe this means the Epic Phantom REACTs will be out by April. Can't wait! I just picked these up to use as lightweight hiking/trail shoes. I'm not crazy about the blue or off-white midsole, but couldn't pass them up for only $90. That is a lot of shoe for such a discount. I have found the ER makes an excellent trail shoe, but my ankles were getting cut up from the brush, so I started wearing velcro ankle gators which are not very comfortable. The Rise should be perfect. The color isn't too important in a trail shoe as they will be trashed after a single hike anyway. 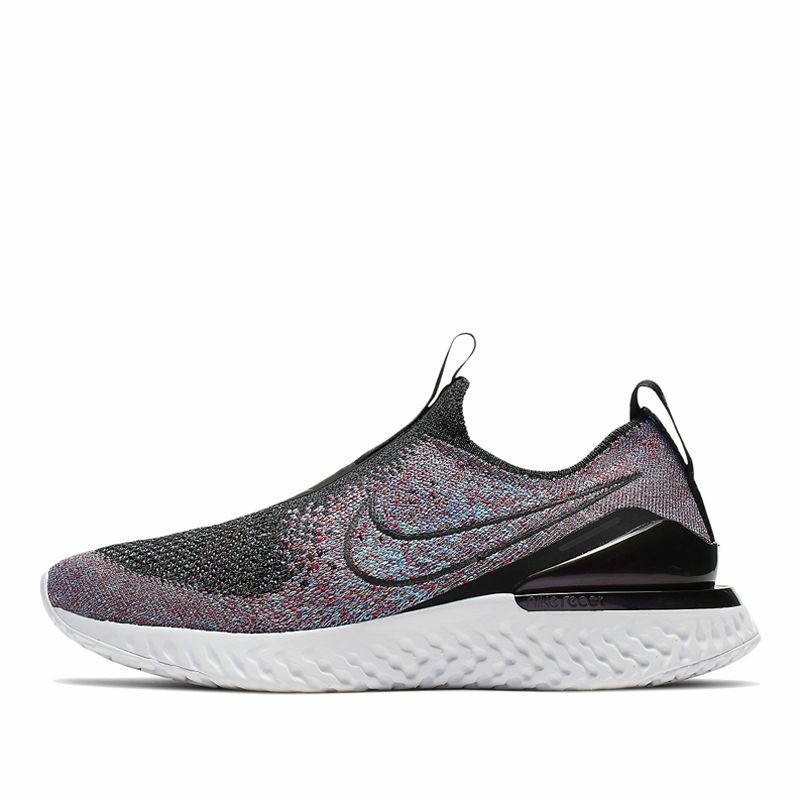 I expect Nike to discontinue the Rise soon as neither the women or mens versions sold well, so get them on discount before they are gone forever. neither the women or mens versions sold well, so get them on discount before they are gone forever. I stand corrected... Apparently, the women's version of the Rise has been red hot in Europe, selling out quickly, and for more than retail on aftermarket. They offered triple black in the women's version in Europe and that was the hottest colorway. If you are trying to decide between the two grays, here they are. The Nike pics make both colorways look two-tone splotchy, which looks like they are dirty or you spilled something on them, but in person the two-tone is not noticeable at all. 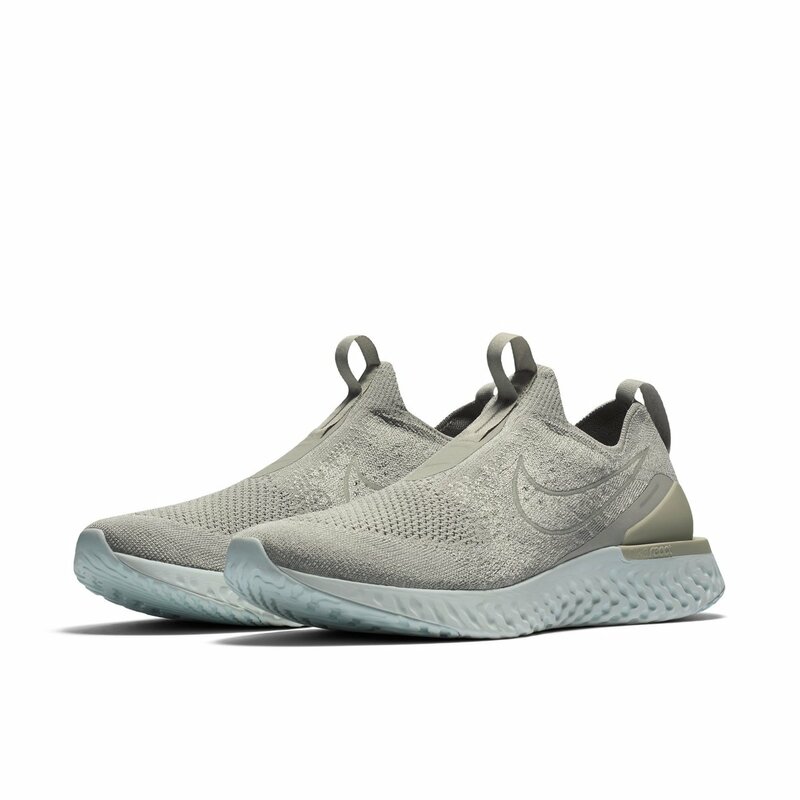 The darker gray has a bright white midsole while the lighter grey is slightly off-white - not really a beige, just a less bright white. All my Rise's were uncomfortable the first few days, but then the flyknit and leather break-in and form to your foot and feel like heaven. The first colorway listed is black/black/university red, but not sure what that means. Maybe triple black with red outline of swoosh? Happy to see the Phantoms coming. Not crazy about the release colorways. I'd like to see more fades and dark midsoles eventually, maybe oreos. Looks like the kids versions get all the good CWs... they will launch with a multicolor already! 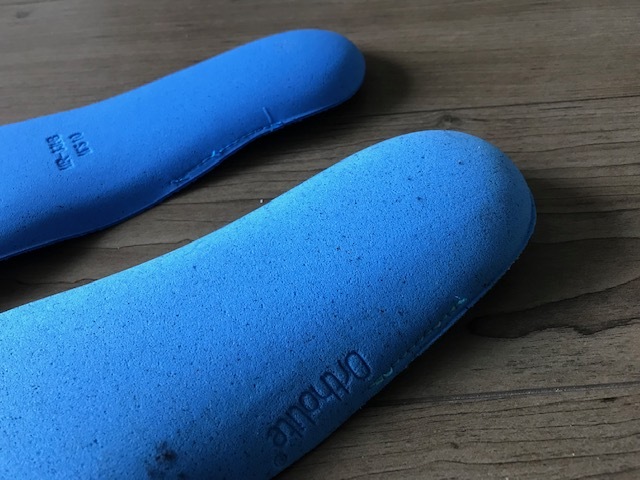 The lastest and perhaps easiest ER mod is to replace the ER insole with the insole from the Epic Rise. The two shoes have identical midsoles, outsoles, and strobel boards. So, I expected them to have identical insoles. Wrong, they are very different. The Rise insole has a very deep sculpted heel. I have always felt the ER is a bit flat at the heel, and if you are unlucky enough to have Plantar Fasciitis, the ER will not work for you. After very long runs my heel is a bit tender. The Rise insole is practically a sphere and gently curves far up the insides of the flyknit upper. Since the ER and Rise shoes are identical, rise insole works perfectly in the ER. Also, at the forefoot, the Rise insole is thicker with squared off edges, while the ER is thinner with tapered edges. I had the exact same thought almost. Some Lunar epics that I had laying around had come with two different insoles (6mm and 8mm). I took the crappy paper thin insoles out of my ISPA Reacts and put in the 6mm in my white and 8mm in my black pair.... a WORLD of difference!